Think the rise of Little Free community libraries is cool? Well, what about community fridges? 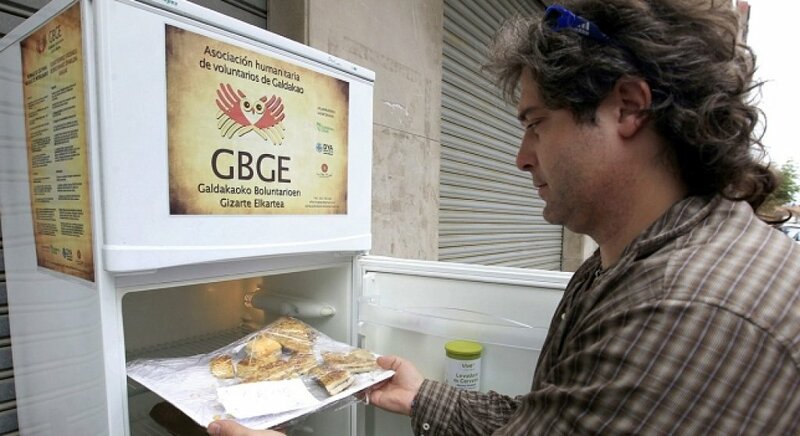 The northern Spanish city of Galdakao has taken to storing leftovers on the streets to combat hunger within the community. This stationary, mini cold soup kitchen, dubbed the “Solidarity Fridge”, is the product of a brainstorm inspired by the global economic crash that has left Spain in recession for the better part of a decade. Alvaro Saiz came up with the idea after images of the Spanish poor dumpster diving drove him into action. Another form of inspiration was drawn from websites like the German foodsharing.de, which, at the last point checked, reported 2,060,297 kilograms of food saved. But Germany is not the only European country in need of food saver relief. According to the Central Intelligence Agency, Spain is the 99th poorest country in relation to the rest of the world, with 21.1 per cent of the population living in poverty. Alvaro wanted a low-tech solution in his more rural town. He approached the mayor with his waste-reduction strategy, who in turn had local law changed to accommodate the project, saving the fridge from liability in case someone became ill after eating from it. In lieu of liability, health safety measures have been put into place that restrict the fridge’s contents to exclude eggs or raw meat and require food to be thrown away after four days. Businesses in the area are reporting that their leftovers have been saved from their fate of being thrown in the dumpsters. Instead, they’re placed in Tupperware, labeled, and delivered to the fridge. Gladakao locals contributing food to the “Nevera Solidaria” aka “Solidarity Fridge”. “When he came to city hall with this idea, I thought it was both crazy and brilliant! How could I say no?” said Galdakao’s mayor Ibon Uribe in an NPR report. An operating and health safety study budget of $7,249 CAD (5,000 Euros) was approved and the project saw the fridge fenced-in to ensure no one took it for their own home. Galdakao’s mayor Ibon Uribe (left) and volunteer Javier Goikoetxea. A 2013 study published by the United Nations Environment Programme tells us that 22% of “total food available that is lost or wasted” is in Europe, and of that 22 per cent, 2.36% of the total waste occurs during the consumption phase as opposed to during the production or distribution process. The study also tells us that in 2009, Europe made up for 14 per cent of the world’s food waste.